If your company or workplace is looking at implementing a last mile shuttle service, congratulations! This is an exciting step that you won’t want to look back from once you take it. Last Mile Shuttle Service is an employee delighter that will allow you to get more productive and loyal employees and attract better talent. This service will pick your people up from their last transit stop and drop them off at your front door. Then, at the end of the day, we’ll pick them up again and drop them off at the nearest location or most logical dropoff point for the Cal Train, BART, bus, or ferry. This will save your employees valuable time, make them less stressed and more productive, and even earn you goodwill in the public eye. However, a last mile shuttle service isn’t for everyone, and making the decision to do it will require you to look at several factors. Take a look at the following points to see if last mile shuttle service would be a good fit for you. The number of employees you have is one of the biggest factors that will make a difference in whether a last mile shuttle service will be a viable option for you. However, don’t consider yourself to be automatically shut out if you’re a small business. 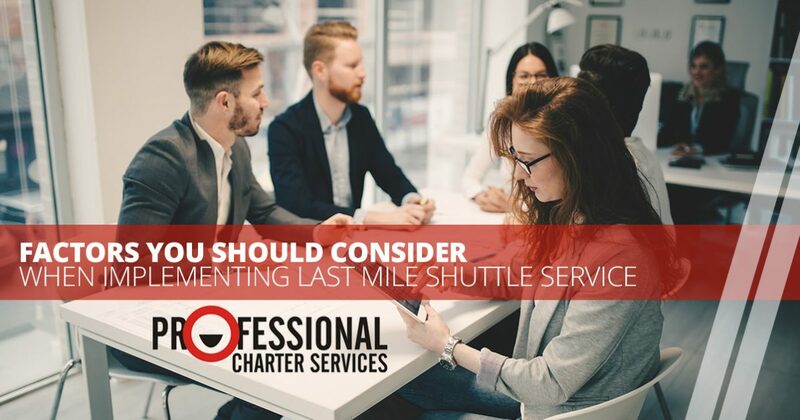 First, consider that even if you have as few as three to four employees who would need a last mile shuttle, you don’t have to send a huge, 60-passenger bus for them. Our fleet includes vehicles like an executive SUV and Lincoln Town Car, meaning that you could simply have us send a smaller vehicle if you have fewer employees. Another point for small businesses to consider is this: If you would benefit from a last mile shuttle but can’t quite afford it until you’re larger, why not pay a visit to the neighboring businesses on each side of you and see if they’d like to collaborate with you? All your employees are going to be heading for the same transit terminals—why not pick up all of them and share the cost? It will be a benefit to your neighbors and might foster additional goodwill between your companies. If you’re lucky enough to be located in the Financial District, you’re in the area with the most densely-packed concentration of transit stops available. However, not every business is located there or lucky enough to be within a block or two of the closest bus stop. Even if you are, it may be one that runs on a less-frequent schedule, while the main terminal where most people will be arriving is a mile or more away. Even in the financial district, people arriving from the ferry have to either walk from the ferry stop, catch a taxi, or board another type of public transportation. The farther away you are from the nearest transit stops, the more sense it makes for you to join our Last Mile Shuttle Service plan and offer your employees a comfortable ride to work. Any time your employees have to change lines or board a different type of transportation, they’re losing valuable time. Would you rather that this time be dedicated to productive work, or have it spent with people being stressed out over whether they will make it to work? A last mile shuttle can help you to opt for the former. Your employees are undoubtedly very good at navigating the transportation network and changing lines as needed, but there is a better way. Offer them the chance to reclaim that lost time and eliminate the distress over missing a stop and having to wait 20 minutes for the next bus or train, making them late to work. Do your employees all arrive at a uniform time of day, or do you have shifts of work or staggered arrivals? It’ll be simpler to implement last mile shuttle services if everyone is expected to arrive at work and leave at the same schedule. However, if the number of your employees is high enough for each shift, you might be able to justify running a last mile shuttle for each one. Getting started is easy — simply ask us for a quote. From there, you can evaluate the decision and we’ll work together on the next steps to getting your shuttle service set up.